SEPTEMBER 2017 • FOODSERVICE EQUIPMENT & SUPPLIES • 121 high-density shelving. "This gives us about 50 percent more shelving space than we would have with traditional shelving." Also in the back of the house, the dish room was down- sized, and some of that space was reallocated to the servery. "The decades-old, flight-type dishwasher was a burden to the operation with high energy and repair costs," Reitano says. "The new, smaller dish room contains a 44-inch conveyor machine, which is much more appropriate for the operation's needs." A three-compartment sink was also added to the equipment mix. The kitchen contains a prep area that includes food processors and a 40-gallon mixer. Hot equipment includes 2 double-stacked combi ovens and 2 rotating rack combi ovens, as well as a 60-gallon and 40-gallon kettle and a tilt skillet. "The previous kitchen size was adequate," Hills says. "But we've had to reconfigure production to add more menu items that are possible to offer now in the front of the house." Staff place menu items on hot and cold pass-through shelves for transport to the servery. Front-of-the-House Activity Flexibility and bringing cooking out front became a priority when designing the servery. "We wanted to offer much more variety than we had when we had just three lines," Hill says. "Now, as long as a food item meets our budget and nutrition guidelines, we have the ability to serve it. Also, because we have more lines, we're not so pressed to get students through the lines as quickly, so we can offer more customizable options." Fresh Fare — two 12-fo ot fruit and vegetable bars — greet students as they enter and exit the servery. "We have always of- fered fruits and vegetables, but we never had shelving to display and merchandise so much produce," Hill says. "This configura- tion encourages students to consume these healthy foods. We've vastly increased the sales of these foods." The servery contains five stations. Grill Zone holds a sandwich slide, panini presses and a hot/cold shelf that holds fries and coleslaw. Staff prepare protein a few steps from the front of the station where other staff assemble orders. Taste of Home's menu features students' favorites such as chicken nuggets and chicken and noodles with mashed potatoes. The school showcases these comfort foods in hot/cold wells. "A quick-switch food well can be hot or cold as desired," Reitano says. 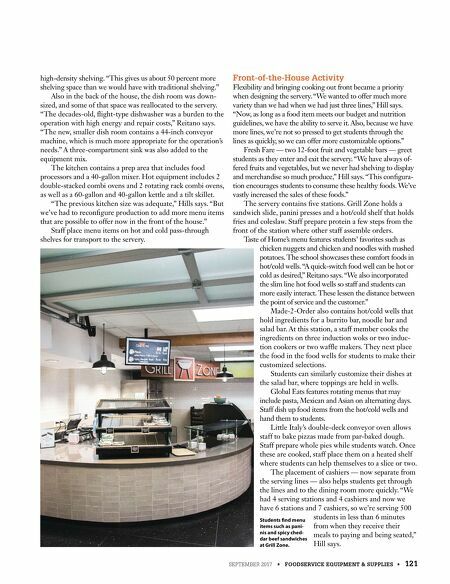 "We also incorporated the slim line hot food wells so staff and students can more easily interact. These lessen the distance between the point of service and the customer." Made-2-Order also contains hot/cold wells that hold ingredients for a burrito bar, noodle bar and salad bar. At this station, a staff member cooks the ingredients on three induction woks or two induc- tion cookers or two waffle makers. 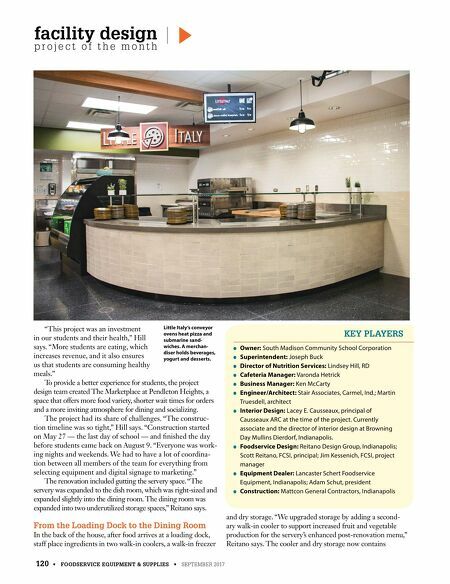 They next place the food in the food wells for students to make their customized selections. Students can similarly customize their dishes at the salad bar, where toppings are held in wells. Global Eats features rotating menus that may include pasta, Mexican and Asian on alternating days. Staff dish up food items from the hot/cold wells and hand them to students. Little Italy's double-deck conveyor oven allows staff to bake pizzas made from par-baked dough. Staff prepare whole pies while students watch. Once these are cooked, staff place them on a heated shelf where students can help themselves to a slice or two. The placement of cashiers — now separate from the serving lines — also helps students get through the lines and to the dining room more quickly. "We had 4 serving stations and 4 cashiers and now we have 6 stations and 7 cashiers, so we're serving 500 students in less than 6 minutes from when they receive their meals to paying and being seated," Hill says. Students find menu items such as pani- nis and spicy ched- dar beef sandwiches at Grill Zone.